Orthopedic dog beds for large dogs aren’t always readily accessible in the current market. Many large breeds are too large to be comfortable or fully supported on most beds, leaving them with few options. Many large dogs must choose between a bed that is too small or sleeping on the hard floor. Large dogs need their own space to feel comfortable, rested, and secure. A proper bed will provide a space to spread out and relax, as well as a firm and supportive mattress to conform to their weight and body shape. These three beds are the best offered in terms of orthopedic dog beds for large dogs. All three options were designed with large dogs in mind and cater to the largest breeds, those that like to curl up or cuddle, and those that need a lower profile and a more supportive base due to health issues. 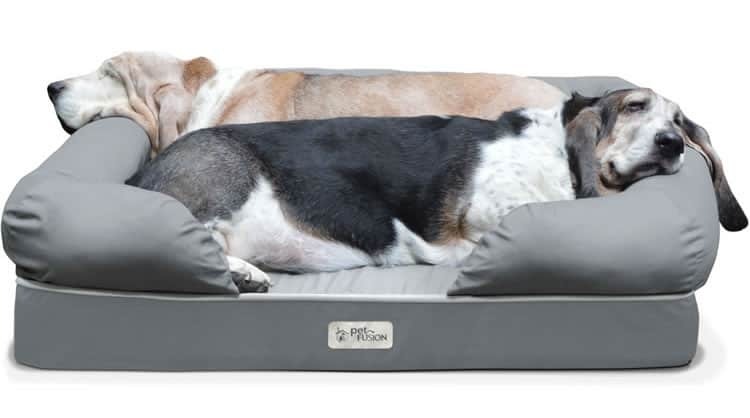 The Big Barker 7” Pillow Top Orthopedic Dog Bed (Headrest Edition) is a flat pillow style bed with a large bolster at one end, creating a headrest. This bed comes in three sizes, Large, Extra Large, and Giant, all of which were designed with large dogs in mind. 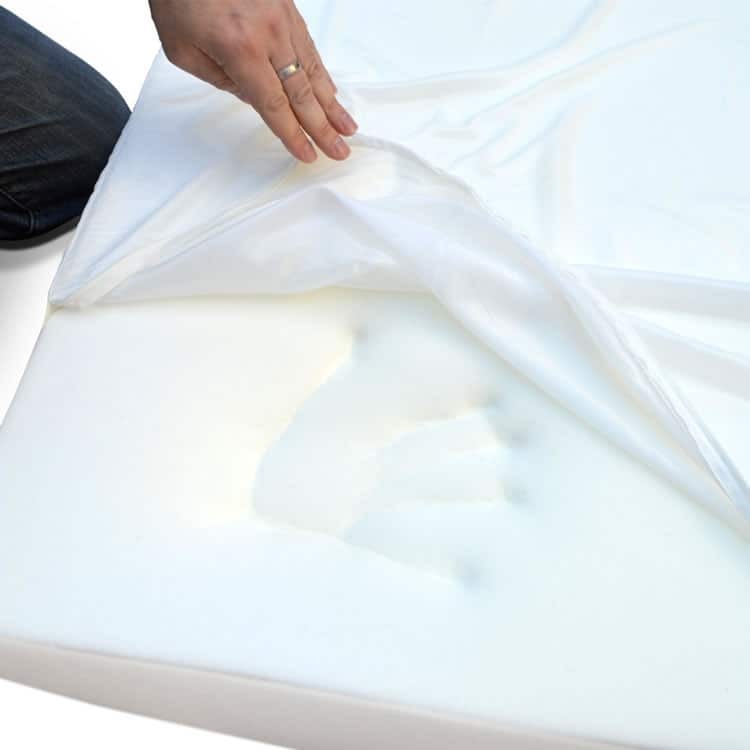 The foam mattress is made of two layers of comfort foam sandwiching a support foam core. This foam will compress and fully support the weight of large dogs, which isn’t something all dog beds accomplish. 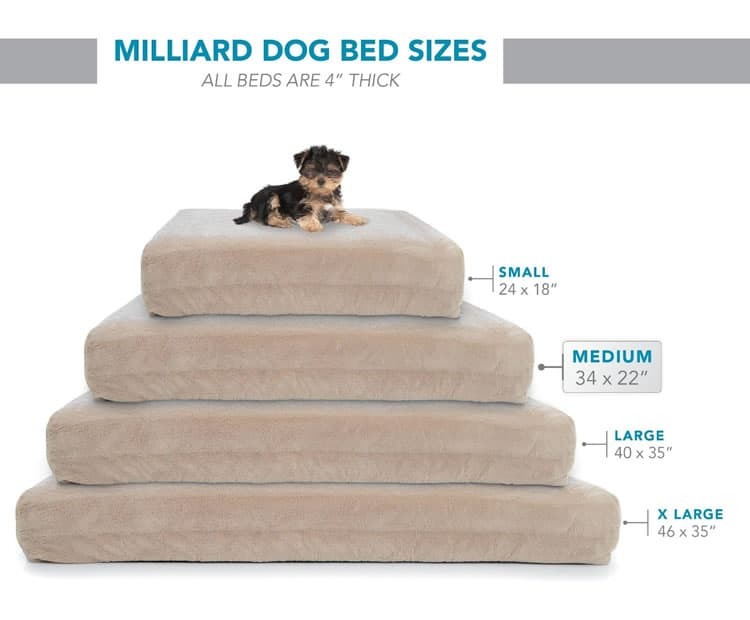 It’s important to choose the right size bed for your pet here because the foam can be too supportive if the bed is larger than the dog breed requires. This particular bed is ideal for the largest of dog breeds. 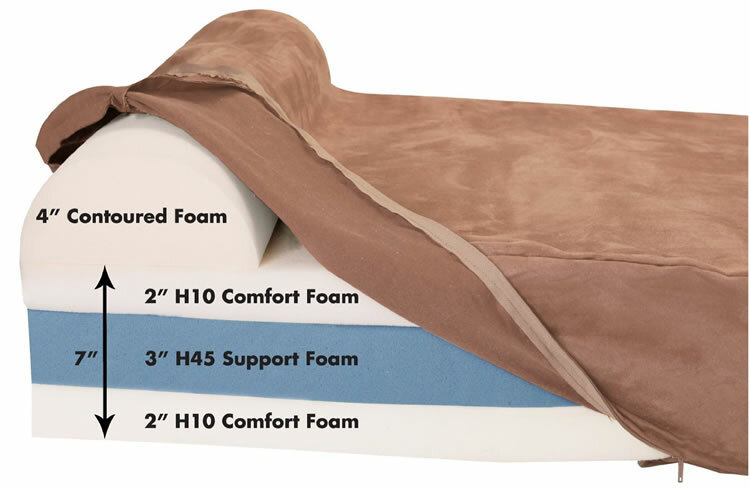 The sizes it is offered in and the thick memory foam were specifically chosen for those large dogs that are often forgotten in the dog bed market. This bed was made with the largest dogs in mind and is designed to suit the weight and size of those large dogs. The PetFusion Ultimate Dog Bed and Lounge is a lounger style bed with bolsters on three sides to create a couch-look. Bolsters provide extra support and are great for dogs that like to cuddle or curl up. This bed comes in both large and extra large sizes to cater to larger breeds. There is four inches of solid memory foam to cushion and support the dog’s whole weight for added comfort and restful sleep. The memory foam along with the bolsters provide a supportive and comfortable bed for dogs who prefer to rest in a variety of positions and favor the added support bolsters provide. This particular bed is ideal for larger dogs that like to curl up and cuddle. Having the bolsters on three sides creates a cozy sleep area that other beds do not provide. This is also a great bed for larger dogs that like to share since it does have more of a couch feel compared to other beds on the market. Many beds for large dogs are flat and don’t include bolsters, which makes this bed unique to those dogs that prefer a bed with support on all sides. 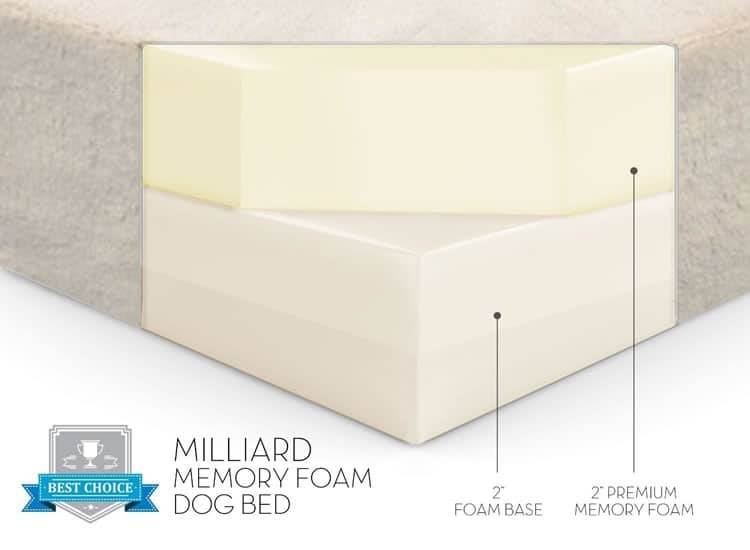 The Milliard Premium Orthopedic Memory Foam Bed is a flat pillow style bed that comes with an anti-microbial water-resistant and non-slip cover. This bed has two inches of each memory foam and support foam to ensure proper spinal alignment and therapeutic comfort for larger dogs. The pillow style design is great for dogs that like to sleep in the traditional dog positions, lying flat, on their back, or sprawled out. This bed comes in two larger sizes, large and extra large, to suit many large breeds. This particular bed is ideal for larger dogs with joint or health ailments. The flat pillow design provides a lower profile that makes this bed easier to get in and out of compared to other softer beds. The anti-microbial and water-resistant cover also makes this bed a good choice for older dogs or those that may need their bed washed more frequently. 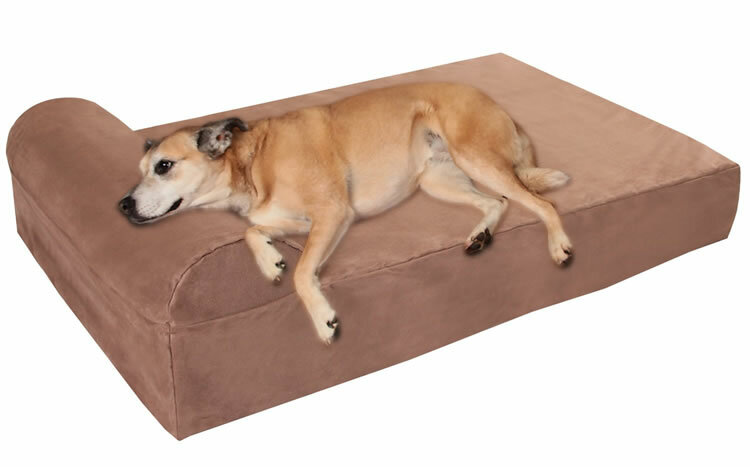 Between the foam cushion choice and the low profile this is a great bed for dogs with joint pain, arthritis, or other health issues and will help them rest and recover more comfortably.